Piscine reovirus - the science is failing us. Piscine reovirus (PRV) is an emerging pathogen of interest on the west coast of North America, however assessment of its risk to wild salmon is impossible because opposite conclusions have now been published in the scientific literature; 1.) PRV is endemic to this coast and harmless and 2.) PRV is Norwegian, causes the disease HSMI in Atlantic farm salmon and the weight of evidence suggests it causes significant harm to Pacific salmon. 95% of BC farm salmon are infected with PRV at harvest, it is spreading to wild salmon[LINK], and many declining runs of Fraser River sockeye, recommended for listing under the Species At Risk Act, are heavily exposed to PRV as they migrate past the many salmon farms dotting the coast. Therefore it is critical to managing Fraser River sockeye that we reconcile the opposing scientific evaluations of this risk. This is why I am writing in regards to your 2016 co-publication with Marine Harvest, Piscine Orthoreovirus from Western North America Is Transmissible to Atlantic Salmon and Sockeye Salmon but Fails to Cause Heart and Skeletal Muscle Inflammation. Your paper concludes that piscine reovirus is highly infectious to sockeye salmon, but does not cause disease in Atlantic or sockeye salmon in BC. “Western North American PRV fails to cause disease” (Garver et al 2016) [LINK]. 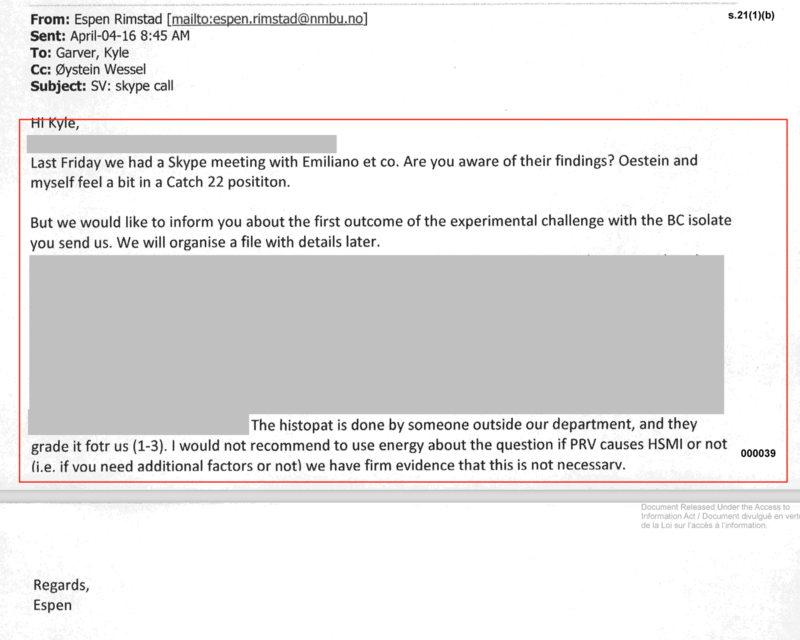 Through the Freedom of Information Act, I have your November 2015 correspondence with Dr. Espen Rimstad of the Norwegian University of Life Sciences, which you received two weeks before PloS One accepted your paper for publication. You are collaborating with the Rimstad lab and have shared isolates of BC piscine reovirus with them. Of concern, Rimstad expresses doubt regarding your primary conclusion that PRV can infect and multiply in sockeye, but then ceases replicating without triggering significant immune response in the fish (pathogen-associated molecular pattern, innate host defense pathways, or Mx proteins). Whether sockeye are impacted by PRV is a question of national interest to the US and Canada. Washington State is relying heavily on the accuracy of your conclusions, PRV “… not harmful to salmon in Washington State waters…”[LINK]. Did Rimstad’s lab get the same results as you, or did the PRV you sent him cause disease in his tests? Many of us have spoke to him about these results last year, but clarification is important. Four months after you published that PRV does not cause disease in BC, another DFO lab reported that PRV is causing disease in BC farm salmon[LINK]. We now understand that the reason HSMI was not diagnosed earlier is because the BC Animal Health Centre developed an added diagnostic criterion for HSMI, which has never been published Download excerpt Marty 2008 ATIP A2016-203. As we understand it from internal communications, if this BC government lab had used the international criteria for diagnosing HSMI, the disease would have been diagnosed in BC in 2008. This lab provided your HSMI diagnostics. Is it possible their method failed to diagnose HSMI in the sockeye? A recent public statement by the BC Salmon Farmers Association highlights the danger of allowing two alternate scientific conclusions to persist. They choose scientific option #1 - PRV does not cause disease, although one of their members, Marine Harvest, lists HSMI as the number one cause of “reduced survival” of fish for the company globally [LINK]. In summary, your work assures us that PRV is not impacting sockeye, but your overarching conclusion, that PRV does not cause disease on this coast has been disproven, the histopathologist examining the fish in your experiment uses an unproven diagnostic that has difficulty diagnosing HSMI and your collaborating lab has expressed significant doubt in the results. 1.) did the PRV that you sent to Rimstad cause disease in his challenge experiments? 2.) 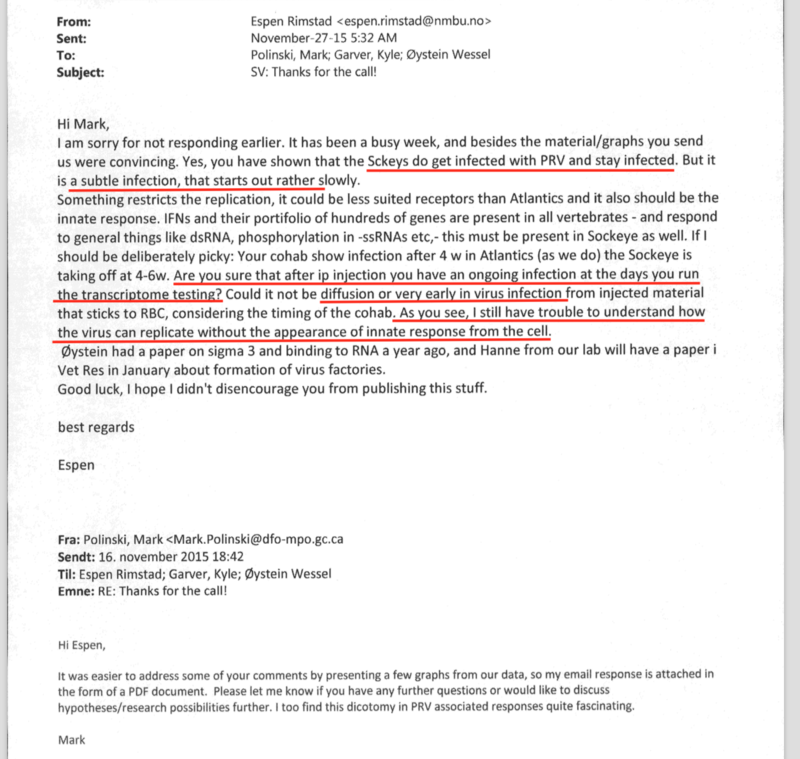 Is Rimstad now convinced that sockeye salmon infected with PRV do not exhibit disease? 3.) Are you solely relying on the BC Animal Health Centre, or has the Rimstad lab also confirmed the failure for HSMI to? Piscine reovirus was not discovered until 2010 after 30 million Atlantic salmon eggs had entered BC and it is precisely the concern voiced by DFO’s highest level BC staff when Atlantic farm salmon eggs began entering BC. Thank you for your attention to these questions. The Fraser River juvenile sockeye which begin migrating to sea soon, will be exposed to the Browns Bay PRV-infected effluent and the many PRV-infected farms. These valuable runs cannot be managed optimally until the origin and impact of PRV is better resolved. Piscine reovirus infected bloodwater pours from farm salmon processing plant into the migration route of the Fraser River salmon off Campbell River. Juvenile wild salmon will be swimming through this plume beginning in a few weeks.